The philosophy of Il Luogo can be encapsulated in these three words, today as it was in the past. 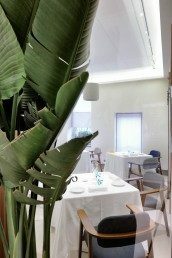 Alessandro, Fabio and Stefania continue the path started by Aimo and Nadia, 60 years ago, projecting their vision of Italian cuisine into the future with consistency and respect. 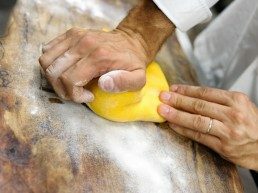 Their creative process is a result of the work of many hands and minds, finding a perfect and unique mark unmistakable in every recipe: a delightful synthesis between hospitality, gustatory memory, contemporary gestures and exploitation of Italian gastronomic cuisine. 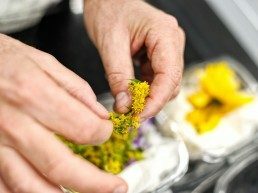 From the art of receiving to the selection of excellent raw materials and suppliers, from the preparation of a dish to the wine pairing, every gesture at Il Luogo is a love act toward the client, Il Luogo and the work itself. Care also with the preservation and exploitation of every primal flavor and natural characteristic of food, essential expression of their history, their geographical origin, the knowledge and consideration needed to produce them and to allow the richness of flavor to emerge as only those from our best, locally sourced commodities can. 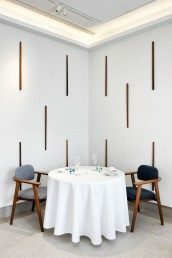 The restaurant has been recently and completely renovated, rethinking every space, perspective, volume and light. Through an accurate selection of materials and furniture, the restyling plan expresses the italian quality that Il Luogo has always conveyed.